Silent Auction wrapped up, very successful. Building Leadership Team meets first Thursday of each month. This month was staffing numbers. See Dan’s report below for more details. Postcard campaign was very successful. Roughly 300 postcards sent out. Will likely do one more push before school year ends. A lot of focus now is on gun violence measures. Also have a few weeks to advocate for the budget for the teacher’s salaries. Put out by SPS; ask for Bryant Elementary to add its name to one of the several schools that have passed this resolution. Two key events are the National Walk Out and March for our Lives. Desire for all students to feel safe and secure in their school environment. This resolution is in following with Washington State National PTA and lists several criteria. (See document distributed in the meeting). Motion made to adopt the resolution above. Motion seconded and passed. Most of north end schools are undergoing concerted effort to lower enrollment. This year there will be no displacement, class size down to 20-22 all the way to 3rd grade. Additional state funding was allocated, but may only last for this year. Mr. Sanger’s waiver for this year was approved; so next year there will be a full-time counselor at Bryant. We currently have two student newspapers! Math Champ students came in 3rd place. Bryant Play is about to begin. Global Reading team won semi-finals! Proceeding to finals on Tuesday. Bryant was the first school that asked to give food instead of takes food. There are now three schools doing this. Presented Bryant with a plaque to honor the Bryant Community for being a part of the Hunger Intervention Program. Presented to Julie and LeAnn. Plan to revise the playground from a community standpoint. The first phase of several is to look at the play structure, then the “green” space, then playground surface. There are City of Seattle monies available. Looking for a sponsor for this project, namely the PTSA. Only basics are in place at this point, but sponsor is required to put in a proposal. Looking at forming a steering committee then ancillary support from community and Bryant families. The grant is a matching grant, largest available is 100k. Another possibility is a sponsored playground by Alaska Air or another airline. Volunteer Coordinator will put out ask to get a few parents on board in these early stages. Likely to wait to get PTA buy-in until next year when the project is already underway. Three meetings have happened so far towards this goal- grant making, steering committee formation, and project management meetings. ADA accessibility is a top priority. Please provide feedback to the committee as it arises about other playgrounds in the city! Ms. Loftin serves as back-up to School RN, involved with safety amongst students and has extensive First Aid/CPR training. This type of training is not required in SPS by anyone but LASER and PE staff, not other staff/teachers. Ms. Loftin feels this is a safety concern: more and more students with serious medical concerns. Many staff would like to be trained; yet time and cost get in the way of this desire. Ms. Loftin has conducted trainings with funding from her own pocket and pockets of participants. She selected a company for this year’s training after many hours of research-procpr.org. This company combines videos, instruction, and practice time. First Aid and CPR training materials will be led by Ms. Loftin, videos and on-line certification/testing provided by this company. Once paid, certification and access to training materials is available f or two years. Ms. Loftin talked the company into a reduction to $20/per person. Asking for money to pay for staff to do this training- it will be conducted on an early release day to provide greater access to teachers. 28 staff members have signed up, but nine more staff are critical to be at this training, totaling $740. Funding required up front. Idea discussed to have this as a line item in the budget- will discuss this at a later time. Motion to cover up to $800 to cover First Aid/CPR for all staff. Motion passed. Typically funds are used for a field trip for Global Readers to downtown SPL, but representative there has retired and filed trip not an option, Suggestion to move those funds to purchase more fiction books and an ice cream party for Global Readers. Motion to take $475 of unallocated funds to Bryant Library funds. Motion made to nominate the three members. Motion seconded and approved. Sumac is currently being used for Annual Campaign and Island Wood, and it is tied into the credit card payments. Request to change on-line payment software from Sumac/Chosen Payment to Giving Fuel effective immediately, with the first project being Island Wood. Motion made, seconded, and approved. Question about enrollment during January with illnesses, second question about whether or not disinfecting a school is a possibility. School District does a once yearly per budget, over the summer. Idea is to create a Sign-Up genius and volunteer effort to disinfect school. There are only certain types of chemicals that can be used. Will research it and report back. 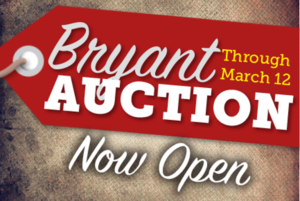 The final numbers are in…and the Bryant online auction raised $34,472! That’s a huge win for our school, and it will make a big difference in funding the important programs sponsored by the PTSA. We want to thank each and every person who participated in the auction. Together, we built our community and made a difference for our students. On behalf of the entire auction committee, thank you for making this auction such a success. We sure had fun putting it together for you! If you’re interested in helping us assemble next year’s auction we’d really love to hear from you at bryantonlineauction@gmail.com! The auction is a big undertaking, and having a larger team would help spread the load. And of course, it’s a ton of fun and very rewarding. Please join us! The Bryant PTSA is joining the Seattle Council PTSA Board and the National PTA in its demands that Washington State and federal governments adopt legislation to accomplish policy goals that would protect our schools and families from gun violence. Whereas, we believe that every child deserves to learn in an environment that is safe and to have the opportunity to grow into a happy and healthy adult. – Require universal background checks and a license to purchase a firearm. – Re-enact a federal ban on the sale and possession of military-style assault weapons. – Increase the Federal minimum purchase age to 21 for all long-guns (rifles) to match current federal regulations for handguns. – Implement Enhanced Background Checks and waiting periods for assault weapons. – Ban the purchase and sale of any accessories designed to increase a gun’s rate of fire. – Eliminate private gun sale loopholes. – Restrict non-Washington state residents from purchasing any firearms in Washington state. – Require firearm safety training prior to the purchase of a firearm. – Develop a state registry that allows one to voluntarily opt-out of the ability to purchase a firearm. – Support prevention, intervention and community re-entry programs that reduce community and gun violence. – Increase funding for programs and school staffing that support student mental health, social and emotional learning, and bullying. Therefore, be it further resolved that the Bryant ElementaryPTSA Board supports solidarity activities on the National School Walkout scheduled for March 14th and the National March for Our Lives scheduled for March 24th, 2018. The 4th and 5th Grade actors and techies have been hard at work rehearsing and putting together this year’s spring play, Peter Pan. Come support our two casts at this annual tradition! Remember to come with cash! We’ll have plenty of bake sale goodies available to get you through the performances! We’ll be pre-selling tickets for $5 each after school on the playground starting Fri, March 16 going through performance nights. Get your tickets early and beat the rush on the performance days. 8 people on Auction team. Auction starts March 5th. Currently have 244 items @ $37K fair market value. If all parent parties sell out, will make $8000.